DEDICATED To my Constituents in North Antrim, for Friendship and Unswerving Support. Two hundred years ago the United States of America became a separate nation amongst the countries of the world. The story of the vital contribution of Ulstermen to that mighty achievement needs to be retold to this generation. It is also most fitting that Dr. Bob Jones, III, the President of the World's Most Unusual University, situated in the Piedmont of the Carolinas and himself of Scotch-Irish stock should write the Foreword. I am indeed grateful to him for a most valuable contribution. The task of compiling this book has been done amidst heavy pastoral and parliamentary duties but it has been a labour of love. Much of its contents has already appeared in the columns of one of the most important local newspapers in my constituency, "The Ballymena Guardian." I trust that the re-telling of this story will give strength and courage to the much tried and gravely misrepresented loyalists of Ulster. The past can give us hope for the present and the future. By BOB JONES III, Litt.D., D.D. "It was here in Northern Ireland that the American Army first began to concentrate for our share in the attack upon the citadel of continental Europe. From here started the long, hard march to Allied victory. Without Northern Ireland I do not see how the American Forces could have been concentrated to begin the invasion of Europe. If Ulster had not been a definite, co-operative part of the British Empire and had not been available for our use, I do not see how the build-up could have been carried out in England." "The common possession of a rich heritage of memories: also the actual agreement and desire to live together, and the will to preserve worthily the joint inheritance. To share the glories of the past and a common will in the present: to have done great deeds together and to desire to do more - these are the essential conditions of a people's being." Those who already regard Ian Paisley, MP, as an eyebrow-raiser will not be disappointed by this, his historical contribution to the American Bi-Centennial: Ever consistent with his outspoken truthfulness, he uncovers and reveals facets of American history which many ardent and devoted US citizens have never had called to their attention; but it is time they were. For too long the fabric of American history which is interwoven with that of Ireland has been coloured Green when, as this portrait of the past reveals, the colour of America's independence should be Orange even as much as Red, White and Blue. Those Americans who speak in hushed, apologetic tones about the American Bi-Centennial, lest the English be offended, should have it called to their attention that there is at least one member of the British Parliament, Ian Paisley, who is proud of his Ulster forebears from whose courage and spilt blood American Independence from English tyranny sprang. The incontrovertible facts of history recorded on these pages reveals that without the Ulster stock which emigrated to America in the late 1600's and which, by the time of the Revolutionary War, had increased to more than 200,000, America may not have prevailed against the British. A look at Northern Ireland history past and present would seem to indicate that prevailing against the English is the purpose for which God brings Ulstermen into the world. With the help of certain prominent political Irish American families, Southern Ireland has received more favourable propaganda than is warranted, to say nothing of contraband weapons for the Irish Republican Army. 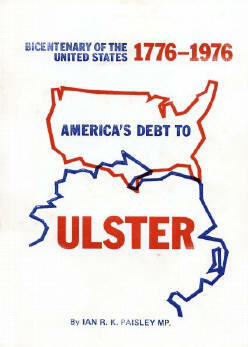 Until this book, the truth about, to which Ireland, America owes her gratitude has been perverted. Equity has fallen in America's streets when she bestows praise and aid on terrorists while ignoring her profound debt to Northern Ireland. The pro-Catholic, pro-Irish press notwithstanding, Orangemen of Northern Ireland were America's truest friends in the Revolution and are her truest friends today. not England, are our own worst enemy. The Orange threads so important to the American fabric when it was first woven continue to play a vital role in the present day because they run parallel to those we are weaving and serve to instruct us by the patterns they now display. It was religious persecution that drove the first Ulsterman to America. Those who were truest to God were also the most loyal to the Crown and to the authority of the King. "They had defended their Province against the last effort of the native Irish to recover their lands." However, a narrow and evil clique in Queen Anne's government sought to discredit their loyalty in order to please a group of prelates. This base ingratitude "galled their freedom-loving souls." In America today the Bible-believing Christians -- that group of solid citizens true to their Constitution and the nation's founding purposes - are considered by many to be the state's enemies. "When the righteous are in authority, the people rejoice; but when the wicked beareth rule, the people mourn" (Proverbs 29:2). Another parallel thread is that of the economic factor existing in America today like unto that which existed from the years of 1714 through 1718 in Ulster when their mass emigration to America turned from a "tiny trickle" to a "river which eventually ran in full spate." Throughout history the Providence of God has often been called "economic disaster;" but it always brings out the best in God's people and works for the advancement of His purposes. America's inflation problems and her other economic deterioration will hopefully again turn Christians in this nation to their knees and, from there, to proclaim liberty throughout the land - a cry that has been stifled in this nation for at least two decades. There are no more continents to which we can emigrate as the Ulstermen did long ago. It may soon be that a new generation of freedom fighters will be called upon to resurrect the ideals of individual and religious freedom and die, if necessary, to restore it. Nowhere in the world could those 20th century patriots find better inspiration than from the tenacity and noble fortitude being demonstrated at this hour in Northern Ireland by the hearty, misunderstood, and maligned Protestant people whose shout of "no surrender" is no hollow cry but a holy creed. Think it over, Uncle Sam! In this Bi-Centennial Year of the United States of America, Ulstermen can lift up their heads with justifiable pride. Today there is a fallacy given great credence both in the United States of America and in parts of Ireland that the United States is under an infinite debt to the Southern Irish for their foundation as a nation. Nothing could be further from the truth. It will be our purpose to set out the hard incontrovertible facts which will prove conclusively that the opposite is true - the American is under an infinite debt to the Ulster Scot. American Independence was in fact pioneered by men of Ulster stock. It will be our aim to show the nature and the value of this vital Ulster contribution, to introduce some of the great Ulster personalities in this most intriguing epoch of American history and to emphasise the religious and spiritual context and content of the Ulster ingredient in America's Charter of Liberty, the Declaration of Independence. A consideration of these matters at this time is both necessary and rewarding not only because this year marks the 200th Anniversary but because it will help to counteract the pernicious propaganda of Irish Republicanism, that Ulster is the natural enemy of the USA. The success of Irish Republicanism in furthering that falsehood is astounding, and the enormous amount of dollars, flowing into the Irish Republican Army coffers from the USA as a direct result, is alarming. It is essential that the almost forgotten truths concerning Ulster's enormous and vital role in the founding and establishment of the great American Republic should be re-told both in the States and in Ulster. Every effort to do this must be greatly welcomed, and to that effort I would like to add this my mite. When the story is told, the claim that Ulstermen can lift up their heads with justifiable pride will be fully vindicated. It should be said that the path we hope to traverse has already been well and truly laid for us by three great masters. One, an Ulsterman, Rev. Dr. W. F. Marshall (a name which will always be honoured amongst Ulster loyalists, especially in the. Sixmilecross area of County Tyrone) in his invaluable book, "Ulster sails West." Two, a Princeton Professor of Politics, Dr. Henry Jones Ford in his massive but most readable volume, "The Scotch-Irish in America." And three, another US Professor, Dr. James G. Leyburn in his scholarly volume, "The Scotch-Irish - A Social History." The scripture poses the question; "What can a man do that cometh after a king?" As we come after these three kings in this particular field, we can but seek to distribute their wealth so that many may be enlightened and enriched by their wisdom. "It is remarkable that this colony of English and Scots that settled in the nine counties of Ulster in the years 1605-1618 is the oldest British colony, It has been thought that Virginia, now one of the United States of America, was colonised before Ulster, but although Sir Walter Raleigh attempted in 1583 to establish a settlement on the coast of America, and named it Virginia in honour of Queen Elizabeth, it was unsuccessful. It was not until the end of the year 1606 that an expedition was sent out by the London Companies, and a colony was not established there until May, 1607, a year or two after the counties of Antrim and Down were settled. Thus the plantation of Ulster may be rightly called the oldest British colony. Great Britain has sent out many sons and daughters since then to many lands, but surely she ought to remember with feelings of the deepest affection her earliest offspring."